Although it seems an illusion Garfield has left his house, has stopped eating, sleeping and watching television to live an impressive adventure with his inseparable friend Oddie. They are going to sail the skies with a hang glider and we will have to control it so that it does not crash on the way. We must avoid obstacles such as trees or birds in order to get as far as possible. Collect the colored bottles that are all over the level to accumulate points to your marker. You have five lives, if you collide you will lose one of them but your marker will be saved, only when you lose all your lives you will have to restart the game and you will start from scratch. 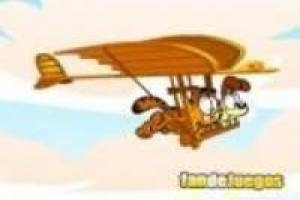 Help Garfield and Odie in this adventure through the air. 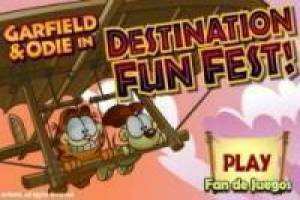 Enjoy the game Garfield and hate, it's free, it's one of our garfield games we've selected.